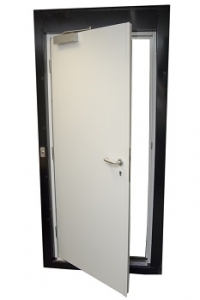 Bradbury Security Doors are neat, high security, personnel doors at sensible prices. Strong steel doors, made-to-measure. Multi-point locking options. Various colours. British made. These security doors are heavy duty (approx 50Kg per single door set with frame) and genuinely high security. Four stainless steel hinges per door. Dog bolts are a standard feature. These are solid steel dowels fixed to the door leaf which locate into the frame when the door is closed, to make attempted forced entry very difficult. Pre-framed, as standard, for quick and easy on-site installation. Every door is bespoke in size, colour, sill type and the type of door furniture and locking system required. Automatic door closers, windows, vents and insulation all available, at little extra cost. Anti-jemmy strip round edge of door leaf. Open in or open out, left-hand or right-hand hinged. Multi-point locking and Secure By Design LPCB upgrade available, at little extra cost. Panic bars and full fire-door specification available. Please measure the opening and phone or e-mail your specific requirements.